Having a birthday in October provides the unique opportunity to have a Halloween theme for a birthday party. Hosts should make adjustments and allowances based on the age of their guests and the person of honor will create a most spooktacular and memorable event for everyone involved. Start your party off right with the perfect Halloween birthday party invitations. Make sure they are age-appropriate for the celebrant and guests. Customizable First Birthday Invitation - This Halloween themed first birthday invitation is highly customizable and provides a space for your child's photo. Expect to spend about $1.50 per invitation. Printed Kid's Costume Party Invitation - If you plan to have a costume party for your October birthday boy or girl, consider a personalized invitation from Zazzle. Pricing starts at just over $2. 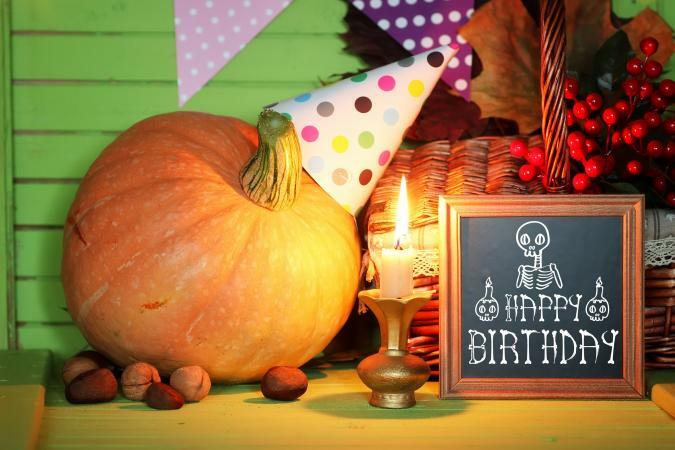 Evite Halloween Birthday Card Invitation - Invite your guests with a virtual invitation from Evite. It features a Halloween themed birthday cake and works for adults or kids. It's free to send. Chalkboard Vintage Invitation - Scrolling calligraphy invite everyone to this Halloween birthday bash. Teens and adults will "come if they dare!" The pricing begins at about 80 cents per card. Someone's Watching Adult Invitation - Host a spooky surprise party with this creepy card featuring an eyeball peeking out from the invite. Get 20 cards for under $40. If the birthday party is for a child, be sure to use choose decorations and treats that are age appropriate. For instance, if you want to use a ghost theme, be sure to use friendly cartoon ghosts instead of ghoulish looking spirits. Pumpkins, black cats and scarecrows are all kid-friendly decorations. Adult Halloween parties can include a lot scarier and a lot more bloody decorations and more intense activities. Choose a more mature sub-theme such as a scary haunted house or a sophisticated masquerade ball. Turn your home or venue into a scary haunted house for your birthday celebration. For children's birthday parties be sure to use less scary options, but for adult parties, go all out. Greet guests with mood lighting (purples, blues, and greens) and lanterns so they know which door to enter. To add a festive touch to the haunted house, hang a glow-in-the-dark "Happy Birthday" banner in the house. Consider adding a few orange colored light-up balloons to the darkened room. Turn the lights-off and cover the windows to create a dark and eerie space. Use black and strobe lights along with smoke machines to add to the creepy feel; however, skip the strobe and smoke if you're planning for young kids. 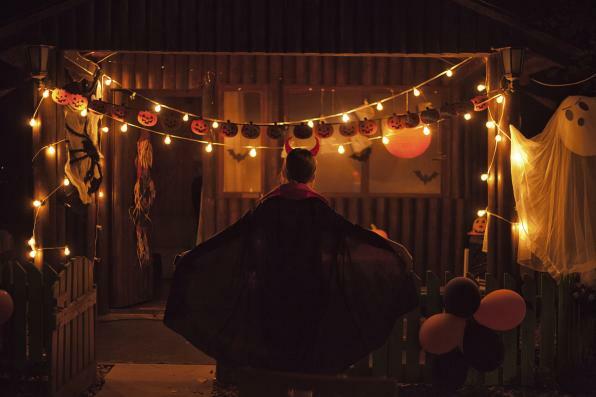 Be sure to hang dusty spider webs, a creepy hanging reaper, and other scary things from ceilings and window to keep the atmosphere scary for adults. A haunted house scene setter works as both a decoration and as a photo op for all invited. A skeleton with a birthday hat or a birthday gift that creates a loud sound/has a jack-in-the-box surprise clown pop out when opened can add to the fun. If you are celebrating an "Over the Hill" birthday, line the walk to the house with tombstones with wording such as "Goodbye to Your Youth" or "Here Lies Your 30's" (or whatever works with the birthday person's age). If someone is turning 21, you could write messages such as "RIP Childhood" or "In Loving Memory of My Fake ID" or another message that indicates that the guest of honor is leaving childhood behind and embarking on adulthood. Carnivals are a traditional birthday celebration theme, but far too cheery for a Halloween themed party. Put a creepy twist on this traditional birthday theme whether you're hosting for kids or adults. Kids - For a child's party, stick to only slightly scary decorations and activities; decorate with the traditional big-top tent but use black and orange instead of red and white. Put plastic spiders into the red and white popcorn containers as a decoration and treat. Even the games can be part of the decor. Yucky games such as asking guests to stick their hands in sticky or weird substances can create a fun, yet gross atmosphere. Adults - Turn it up a notch for an adult party by asking a friend to wear a creepy clown costume to scare the guests and hand out gross eyeball balloons. Or, buy this five foot Evil Clown animatronics to lurk in a dark corner. Be sure to tie some "Happy Birthday" balloons to his hands. Both kids and adults will get a kick out of seeing stuffed zombie animals on pedestals around the area. Just wrap them in white toilet paper or crepe paper to create the right look! Halloween birthday decorations can go beyond the obvious choices of orange and black balloons. Of course, you can use your traditional Halloween decorations and birthday decorations, too, if you color coordinate your selections. A black and orange pennant banner is a simple, but beautiful wall decoration. Carve a pumpkin with the words, "Happy Birthday" to use as a centerpiece. Use Halloween decorations, such as skeleton wall hangings and stuffed black cats, on tables. Cute options are great for kids while more eerie selections work for adults. Use fall colored flowers in your decorating with a hollowed out pumpkin serving as the vase. In fact, creating several of these focal points is a good way to decorate all tables and the party area for an adult or family-focused party. 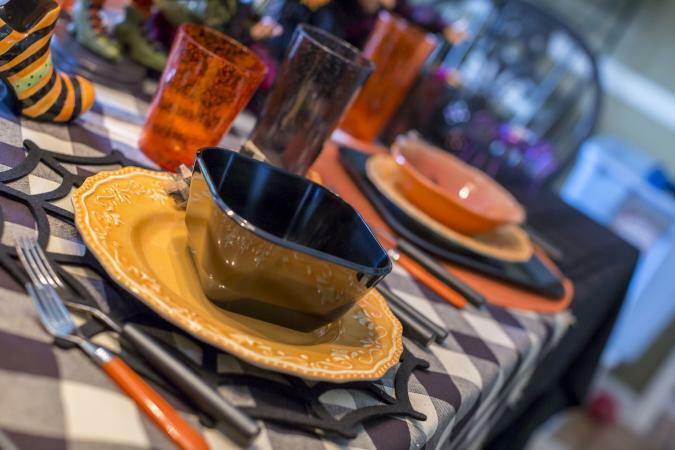 Set the dinner table with themed orange and black plates and bowls for a festive look. If you live in an area where fall leaves gather on the ground, rake leaves together to form the number of the year the birthday boy or girl is turning. This makes for a free and festive outdoor decoration perfect for kids. Hang a spooky birthday banner above the cake table for a finished look. Another fun spin on a traditional decoration is to use a pumpkin as your guest book. The pumpkin can be painted white or any other color if you choose, or just leave it plain. The pumpkin itself is a traditional decoration, but leave a variety of thin-tipped permanent markers nearby and it can turn into an adorable way for guests to convey warm wishes to the birthday boy or girl. Be sure to take photos of all the messages before the pumpkin deteriorates. If you want a more sophisticated affair for an adults-only party, consider hosting a masquerade ball. Gold, silver, and black can be your main colors; they provide an element of luxury while working well for Halloween. Decorating can be made easy with this simple kit that includes an arch and mask standee. Invite guests to come in formal wear and provide masks for guests. Alternatively, provide each guest with a mask of the birthday person's face. Add metallic birthday balloons throughout the area to incorporate the birthday aspect. Banners and wall hangings can feature black and gold birthday candles to match the masquerade aspect. Spray paint dollar store pumpkins gold and black to use as table decor with LED tea light candles. If you have some dry tree branches available, spray paint them black and add sparkle to the paint when it is still wet. Put bunches of these trees in buckets (wrapped in fabric) to fill corners of the room with spooky, but sophisticated décor items. To add to the creepy look, consider adding some bats or black birds to the branches. The menus for an adult party might be very different from a party with young guests. Take a clue from the honored guest and be sure to include some of his and her favorite foods. For adults, cocktails and more sophisticated treats are appropriate. Appetizers - Start the dinner off with some appetizers such as Deviled Eggs, crackers with a yummy dip, and a traditional fruit plate served with haunting toothpicks. Dinner party - If you want a sophisticated Halloween dinner party to celebrate the birthday person, consider serving steak, potatoes, a vegetable such as asparagus and dinner salad. Or for a more casual dinner, lasagna with garlic bread is usually a crowd pleaser. Self-serve drinks - If you want to include self-serve drinks to your party, consider serving a blood red punch (try cranberry juice and lemon-lime soda mix). If you want to make it even more festive, stack two bowls inside of each other and fill the bottom bowl with dry ice so it appears that the beverage is smoking. Adult beverages - A popular beverage with a scary name is the Bloody Mary. Add a Pumpkin Martini to your menu. Create your own Halloween cocktail and give it a spooky name or name it after the birthday girl or boy. Don't forget to include lots of candy, but also keep in mind that many parents like to limit their child's sugar intake. Be sure to ask about any dietary restrictions for your young guests. Appetizers - Include cheese puffs that look like bones and orange foods like carrot sticks and small oranges into your menu. Some parents worry about too much sugar consumption, so think about adding some non-sugary treats like a meat or fruit plate. Main course - Serve some kid-friendly foods such as mac-and-cheese, grilled cheese sandwiches cut into Halloween shapes with cookie cutters, or chicken sticks. 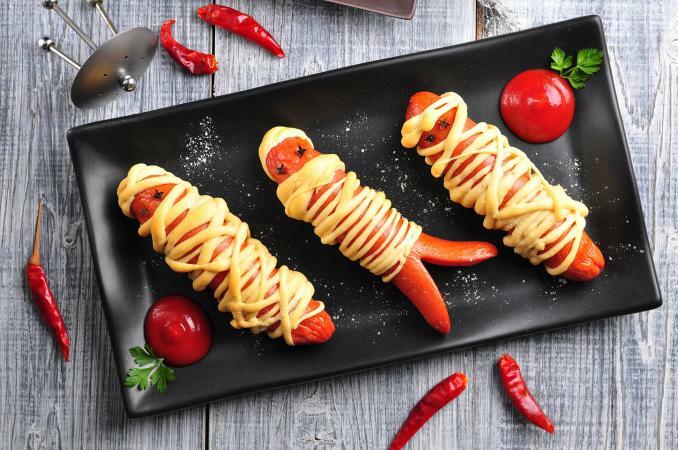 Another option is to wrap hot dogs in strips of crescent roll dough to make them look like mummies. Put a little cone shaped paper party hat on each mummy when you serve them. Side dishes can include chips served in festive bowls, potato salad, or coleslaw. Beverages - Try to reduce the amount of sugar in beverages because the guests will likely have a lot treats and cake. Serve lemon water, milk, or low-sugar fruit juices. Consider a buffet filled with Halloween party foods, like popcorn balls and candied apples, for your guests. It will eliminate having to serve guests and will free you up to visit with guests or tend to other party details. Salads - Provide guests with a couple of salad options. A fresh green salad is always a good option and can be purchased pre-made to save time. Add croutons, cucumbers and olives and a couple of dressing choices. Other salad options include three bean salad, pasta salad, or coleslaw. Main course - If you choose to barbecue, you can throw both hot dogs and hamburgers on the grill. Provide buns and condiments. Another easy buffet items is ham or another meat with tomatoes, cheese, and lettuce on the side. Desserts - Of course birthday cake or cupcakes should be served at a birthday party, but consider offering other options too. Sugar cookies shaped like jack-o-lanterns, ghosts, or balloons would be a good option. You could also serve pumpkin pie or the birthday person's favorite dessert. You could also have a candy buffet full of treats such orange jelly beans, traditional and trick-or-treat candies. For a fun twist, add some chocolate covered scorpions to your buffet. No birthday is complete without a birthday cake. For instance, you could choose black and orange icing to decorate the top and include pumpkins in the design. You could also feature a "graveyard" on the cake and include a message such as "Have a Spooktacular Birthday." Cupcakes are a nice alternative to the traditional birthday cake. Consider serving a carrot cake flavored cupcake with cream cheese frosting and garnish with scary edible knife toppers. Drizzle blood red icing around the top to complete the look. 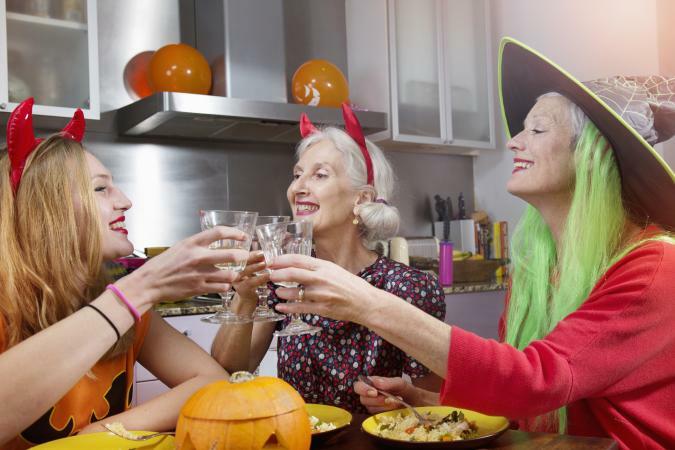 Some Halloween birthday party games and activities can be featured at either an adult or child's party (such as bobbing for apples), while others are more suited for a specific type of guest. Take the idea of trick-or-treating and turn it into a fun birthday activity. Set-up tables or create various areas that guests have to visit in order to receive candy or a surprise. For a fun twist, provide an activity at each station. For instance, have guests sign a guest book for the birthday person in order to get a prize. Another station could have a video camera set-up where guests could record a message for the birthday person before they receive their treat. This activity would be best for children, but could be adapted to an adult party by including grown-up activities and mature treats. Invite your guests to dance the night away inside the dark and scary depths of a wicked witch's black pot. Cover walls and windows with black plastic to look like the sides of the cauldron. Don't forget to add some eerie lighting and lots of smoke machines to represent the steam coming from the boiling pot and play some spooky tunes along with some of the birthday boy or girl's favorite songs. A dance is fun for all ages, just make sure there is enough light to see (safety first!) and that the music is age-appropriate. Turn a traditional costume contest into a fun birthday activity. Kids can come dressed in their costumes and have a parade for parents, then wear their costumes throughout the whole party. For adults, provide a box of props and costume elements that have something to do with the birthday boy or girl. For instance, if the birthday boy is an avid golfer, fill the box with crazy golf gear. If the birthday girl is known for her love of high heeled shoes, be sure to stock the box with crazy shoes in a variety of sizes (found at thrift stores). Ask guests to dress themselves from items in the box and then judge the costume contest and award the guest who best represents the birthday boy or girl with a prize. Children love pinatas and a Halloween themed birthday party is the perfect time to have a pinata which not only serves as an activity, but as a decoration. To turn this into an adult activity, fill the pinata with more "grown-up" items like gift cards, fine chocolates and money. Always let the birthday person take the first "whack." Turn a room of your house into a spooky haunted house. Fill it with traditional, age-appropriate haunted house props. Hid traditional birthday symbols and items in the house. Items could include a balloon, wrapped gift, party hat, noise maker, or birthday card. Give guests a list of items to retrieve and let them loose. For safety sake, you can have each participant enter the "house" one-by-one. Then simply re-hide the found items for the next player. The player who survives the scary house and finds the most items in a given time is declared the winner. 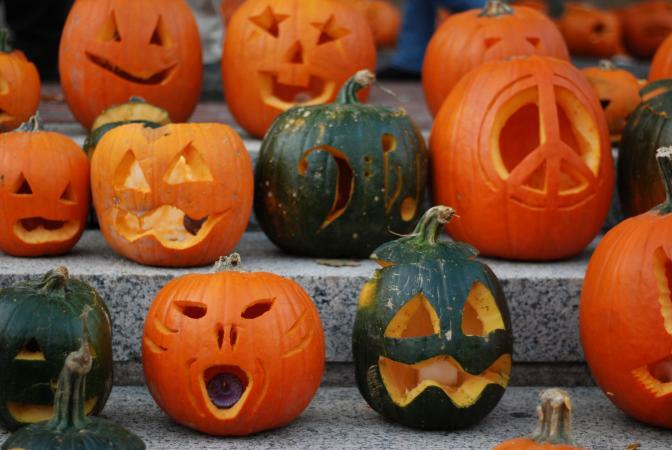 For an adult party, provide knives and newspaper, an electric candle and other items needed to carve a pumpkin. Ask guests to carve a pumpkin that best represents the birthday person. The guest of honor can be the judge at the end of the night and award a prize. For younger guests, provide paint and brushes to decorate the pumpkins and give each participant a prize. Find the biggest television screen you can and play a series of Halloween favorites. Serve popcorn and candy. Play "It's the Great Pumpkin, Charlie Brown" for a child's party or something scarier such as Disturbia for adult parties. If you live in an area with mild weather, consider renting a projector and watch the movie outdoors. Send all your birthday party guests home with a fun treat. Trick-or-treat pails - Fill traditional trick-or-treat pails full of candy, stickers and other goodies as a take-home gift for guests. Be sure to fill with the birthday child's favorite candy. Caramel apples - Caramel apples are fall favorites and are a great take-home gift for guests of all ages. Candles - Adult guests might like to fill their house with pumpkin spice scented candles. Tie a ribbon around the neck in the color scheme of the party and add a "Thank you" note to it. Spider organza bags - Fill small bags with orange or purple jordan almonds or fancy wrapped chocolate candy. Cotton candy - Cotton candy is a fun treat for kids. Make the presentation even more fun by serving the cotton candy in a clear plastic bag and place a plastic spider inside. Wrap the plastic bag in a colorful ribbon and send your guests home with a bag full of yummy spider webs. BeanBoozled Jelly Beans - Send guests home with this fun treat. Some of the jelly beans have traditional flavors such as licorice or cherry, but also include look-alike beans with yucky flavors like ear wax and boogers. Skull Wine Glasses - This is a great gift for adult guests. Use the glasses as a table setting and then send it home with guests as a great reminder of the party. It's important to remember that the party is primarily to honor the birthday person, so don't let the Halloween theme overshadow the primary goal of having a celebration for the birthday person. You want him or her to know s/he comes before the holiday festivities!